After a few attempts at making Buttermilk Parmesan Biscuits to serve as little brunch sandwiches, I finally arrived at a recipe I like. May I share it with you? The original attempts, based on a recipe shared with me by W, resulted in very soft, somewhat oily spoon-drop biscuits, shown below. For subsequent attempts, I reverted to using my favorite buttermilk biscuit recipe as a starting point, based on a recipe my mother gave to me. Finally, I got the recipe to a point I’m happy with for a brunch this past weekend. 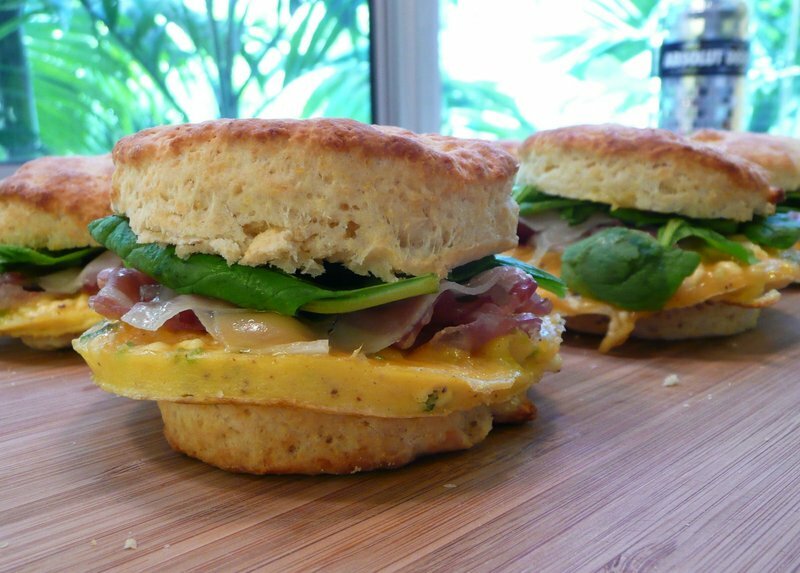 I made little round scrambled eggs with some fried pancetta on top, added some spinach leaves and made a biscuit sandwich out of them. I bought a pair of non-stick steel rings to form the eggs. 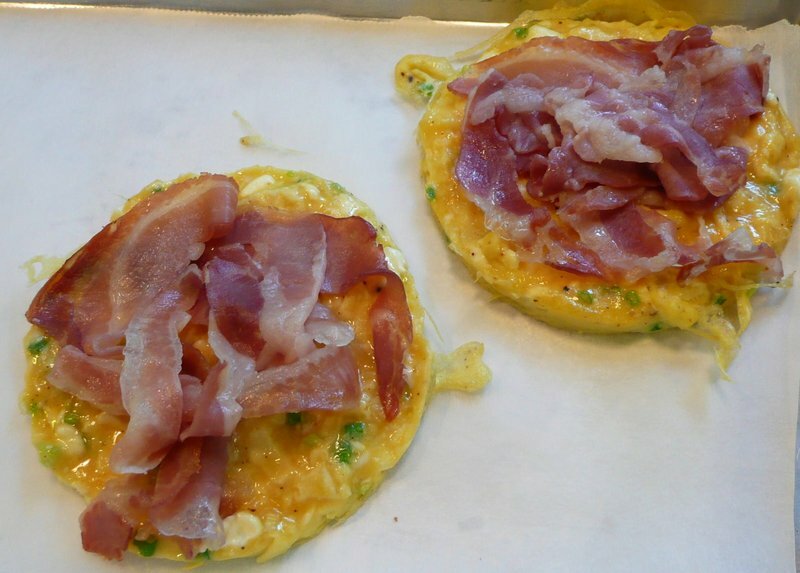 A few chopped green onions and some cream cheese mixed in with the eggs make them nice and tasty. The pancetta was from the market, sliced thin to order and then fried for just a few minutes to crisp it up. The end result were these lovely, flaky sandwiches. The only thing I forgot was to add some chopped green onions to the biscuits themselves. Here is the recipe for the biscuits. I’ll let you figure out the sandwich part on your own. You can also use smoked salmon as a filling instead of pancetta. Combine dry ingredients in a bowl and thoroughly mix. Cut the butter and shortening into the dry ingredients, forming pea-size crumbs. Combine the shredded Parmesan cheese into the mixture, ensure that it is evenly distributed. Make a well in the center of the dry ingredients and pour in the buttermilk. Mix with a fork until combined. Be careful not to over-mix; the goal is to make sure the ingredients are just combined. If desired, mix in the minced green onions. Turn the dough onto a lightly floured board and fold the dough over on itself five or six times, forming layers. Pat the dough to an even thickness of about 3/4 inch (you can make it thinner or thicker depending on how thick you want your biscuits to be) and use a biscuit cutter to cut the biscuits. When you cut the biscuits, don’t twist the cutter. This seals the edges of the biscuits and retards their rise in the oven. Better to just cut by pressing straight down. Place biscuits on a baking sheet (no need to oil it although you can use parchment paper if you like) and bake immediately in a 425 F over for 10-12 minutes until golden brown. Remove from oven and serve while still hot. You can substitute 1/2 cup of the unbleached flour with whole wheat flour for a healthier, whole grain biscuit. They won’t puff up quite as much so row them a little thicker than you otherwise would. If you don’t have buttermilk available, you can substitute regular milk. Before you make the biscuits, take 3/4 c of milk less one tablespoon, and mix in one tablespoon of white vinegar. Let sit for ten minutes and then stir. The milk will have thickened a bit, producing a similar texture and taste to buttermilk. This entry was posted in Uncategorized and tagged baking, biscuits, Brunch, Buttermilk Biscuits, cooking, food by christao408. Bookmark the permalink. wow, that looks delicious! thanks for sharing the recipe; i’m definitely going to have to try that sometime! You can just see my pattern.1) Do you have a recipe for _______?2) Can you post it?3) Can you make a video about it?4) Can you send some samples? It does look delicious and maybe simple enough for me. It looks delicious and healthy. As for the recipe? Thanks, but I don’t cook! 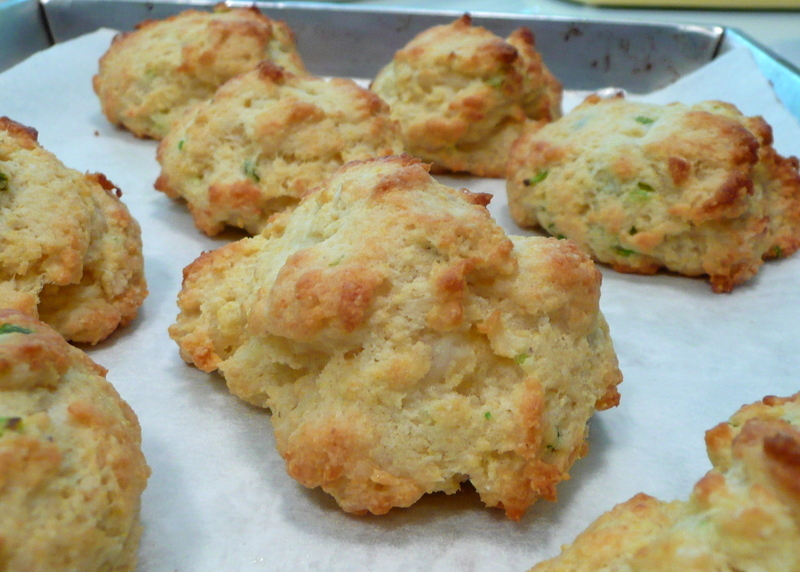 @ElusiveWords – Well, truth be told this entry goes back to Gary’s entry about W’s parmesan buttermilk biscuits. I emailed W for the recipe and then we corresponded about the results, which I found too oily. I’ve been working on a better biscuit, so to speak, for a month now. But you can keep making requests and we’ll see if there is in fact a pattern. =)Oh, and please do try them. They are great on a weekend morning and are really quite easy to make. If you don’t have buttermilk, you can just use regular milk and omit the baking soda. Or you can use the substitution I mentioned in the notes. @kunhuo42 – Thanks, Aaron. I hope you’ll try them and share the results with us soon. I’m coming to brunch at your place!!! Did you cut the butter with a processor or fork? I make a lot of scones but haven’t had much success with biscuits for some reason. Interesting comment from minhaners regarding scones and biscuits…they are so similar in ingredients and preparation. One thing to be really carefully of is overkneading. You don’t want the fat crumbs to break down too much as that is important for the flakiness of the biscuit/scone/pastry. Chris has probably mentioned this in previous blog posts. These do look delicious. I’ll have to try them for a change in our breakfast routine or for lunch. @Dezinerdreams – You could always start… =D@yang1815 – Shame on you for not eating breakfast yet! @TheCheshireGrins – That would be lovely. @minhaners – @jandsschultz – I use a pastry cutter and a knife. Haven’t owned a food processor since the US because of space constraints, although I’ve been thinking about getting one. In my experience, scones are generally more crumbly and biscuits more flaky. love the biscuit sandwich! gosh time for my dinner……. These look delicious! Of course there is a major problem in my house. My husband is opposed to eggs on any type of bread. He thinks that there should be a law to prevent putting eggs on bread – outlaw Egg McMuffins, egg sandwiches, eggs on biscuits or croissants… If I make an egg sandwich he looks horrified and will avoid watching me eat. I think he must have had a bad experience as a child. @murisopsis – Hmmm… very odd. Fried egg sandwich is a wonderful, easy meal. @christao408 – hmm… ok, i admit, i’ve been bad about sharing my adventures in the kitchen with everyone. i recently did a proof-of-concept test of some pumpkin truffles, but forgot to take pictures of them before we ate them! i’ll make more for thanksgiving, though, so maybe i’ll remember to snap a few photos then. Looks delicious. When I have time, I’ll have to try them out. Thanks for the recipe! Maybe I can get Ryan to make those for breakfast on a weekend! @kunhuo42 – I look forward to seeing them. They must have been mighty tasty if you ate them all before thinking to take pictures! =D@swcheng15 – Ryan should do that. Pamper the wife! @brooklyn2028 – Well, if you substitute butter for shortening the texture will be very different. It will still taste good but there will be more of a crumbliness than a flakiness. Try it and let me know how it works. @fickleboy – You’re welcome.